I have lived my life surrounded by strong, vocal, intelligent, feminist women. I was raised to know that all genders were equal and to fight for that if anyone told me otherwise. I have also been incredibly lucky to not have to fight with the most important men in my life. These are men who don’t just say they’re feminists – they live it, teach it, and shout it from the rooftops. And I want to thank them. When I was a teenager, my dad insisted that I go out and do things by myself. Go to the movies. Grab lunch. Read a book in the park. I couldn’t understand why he wanted me to do these things. Why would I want to do things alone? “I want you to be comfortable doing things by yourself,” he insisted. Many years later, I realized that he wanted me to be comfortable and independent as a woman, and never need to rely on someone else, specifically a partner, to be fulfilled. I go to the coffee shop a lot by myself these days. When I was in college, over the dinner table, my father awkwardly said out of the blue, “You should get the HPV shot. I want you to be safe.” This was incredibly difficult for him to say, as sexual activity isn’t something my father has been too keen to talk about. But he wanted to make sure I was safe as I made those choices. I had already started the HPV shots, but I’ve never forgotten that moment. 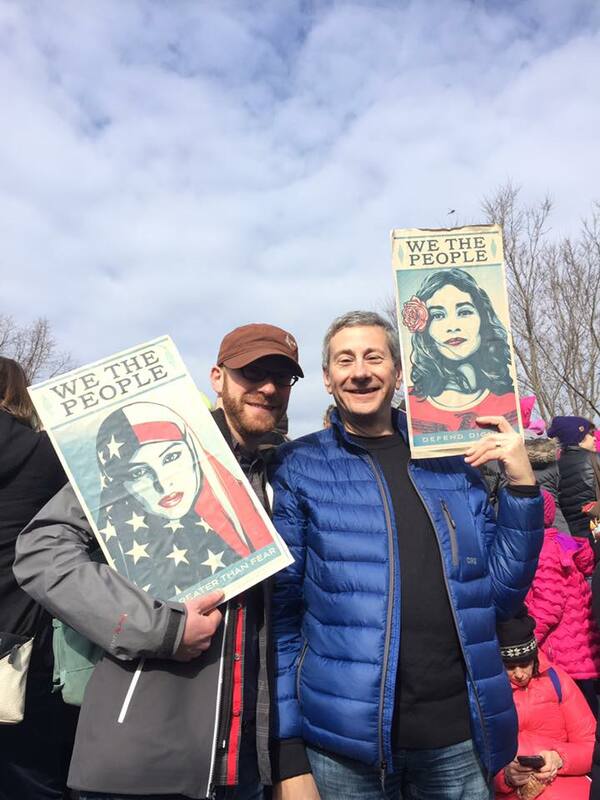 The author’s brother and father at the Women’s March Boston. To be frank, I didn’t have a great relationship with my brother growing up. He was incredibly smart and focused and as his younger sister in high school, the (negative) comparisons to him came early and often. I wasn’t even known by my first name until he had graduated – just Little (Our Last Name). But as we grew into adults, and learned more about each other, I discovered his passion for feminism and equality. It came so naturally to him, as if it never even occurred to him for it to be otherwise. My brother, a Peace Corps veteran, naturalist, and ginger lives his life challenging the status quo. Though he proudly went to the women’s march in Boston with my father and his wife, he does so more quietly in his life in the simplest way. He lives his life regarding all genders as equal. His marriage, business, and friendships are not split along gender lines. And to live that equality as an example is how all men should be living. If I had a nickel for every time my partner shouted, “WOMEN ARE PEOPLE, TOO!” we’d have an additional retirement fund. My other half, the man I will spend the rest of my life with, noted on his Tinder profile that he was a feminist. Granted this could be a warning sign, but luckily it wasn’t. From the day we met, he lived it. On our first date, he happily let me split the check, which is an argument I had often on previous dates with other men. From the moment we got engaged, he never expected or requested I change my last name, become a housewife, or become subservient to his needs and wishes. Though our relationship sometimes splits into gender roles, it’s not because we forced it to. I make dinner most nights because well, to be honest, I’m just better at it. I do most of the cleaning because, well, someone doesn’t know you’re supposed to sweep before you mop. (See also: I’m better at it.) But he, like my brother, lives the example of equality. He’s vocal in his opinions, and fights for women’s equality – it wasn’t even a question for both of us to not attend a Planned Parenthood rally nearby. The author and her partner at a Planned Parenthood rally in Boston. I mean he’s not technically in my life, but still… Canada Bae. Next Post WrestleMania 33 – The Novelization!